We all dream but few of us manage to make those dreams come true. Mark Byron, known by most as Nobby, numbers among those happy few. 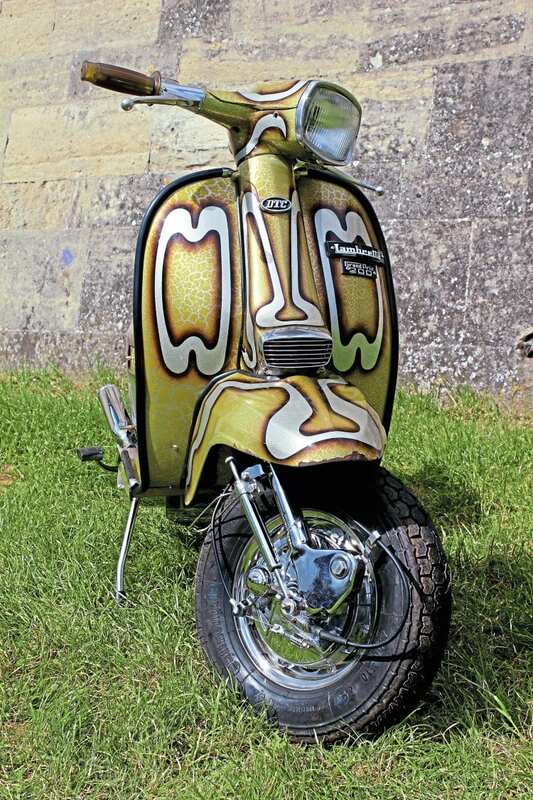 Hooked on scooters in the very early 80s, Nobby saw Lammys and Vespas aplenty parked up at his local youth club. The older lads who owned them weren’t shy about recounting their rally-going adventures and this only increased Nobby’s desire to join in. So on reaching his 17th birthday, young Nobby traded up his PK50 for a T5, and set off to his first national, DiSC 86. When he got there he experienced everything he expected, and much, much more! 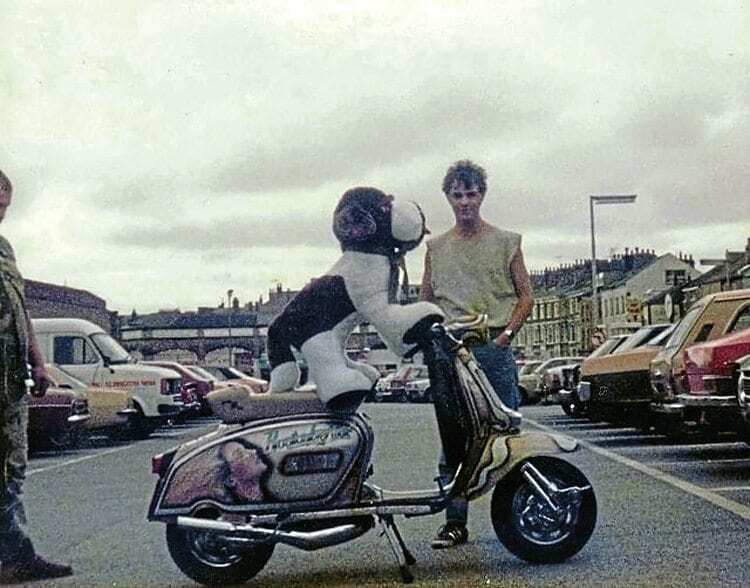 Acquiring his first Lambretta shortly thereafter, he treated it to a home shed rattle can custom job and a lifelong obsession with Innocenti’s finest was born. This was the 80s, remember, and Nobby wasn’t short of inspiration in the abundance of glittering metal flake electroplated creations to be found at rallies. 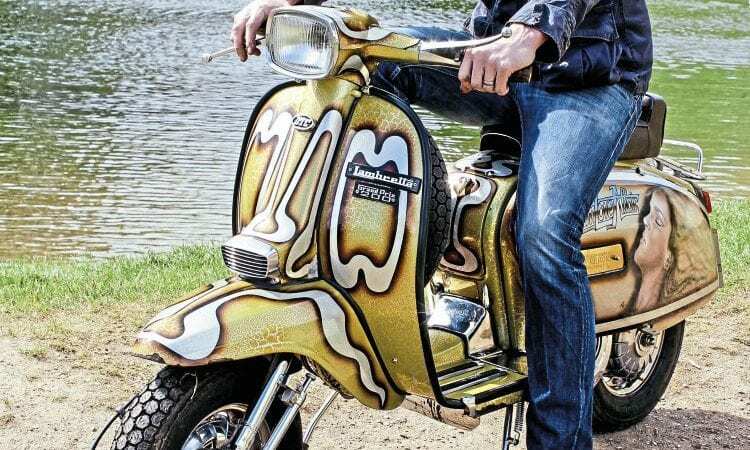 Sadly, Nobby had little in the way of spare income but nonetheless he dreamed of owning one of these scooters during his formative years on the scene. 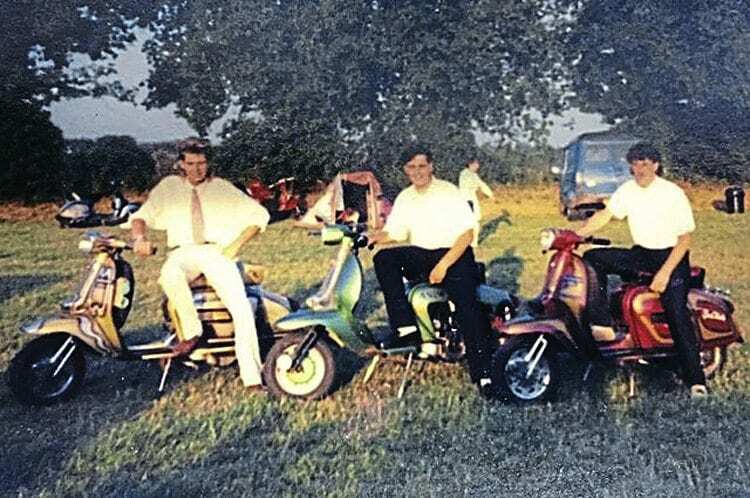 Now, some 30 years later, his dream has been realised: he owns and rides Brazilian Love Affair – one of the actual scooters that had a major impact on his young and impressionable mind. Nobby takes up the story. 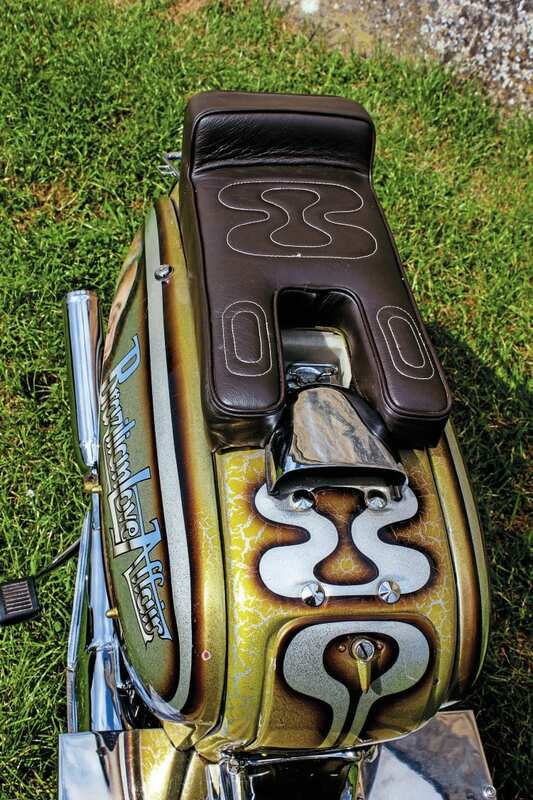 “As a 17-year-old apprentice, on low wages in the 80s, the custom scooters of the time were objects of desire. Scooters with metal flake, vreeble, flip-flop and other kinds of fancy paintwork, and pin-striping, fogging as well as murals were absolutely stunning. 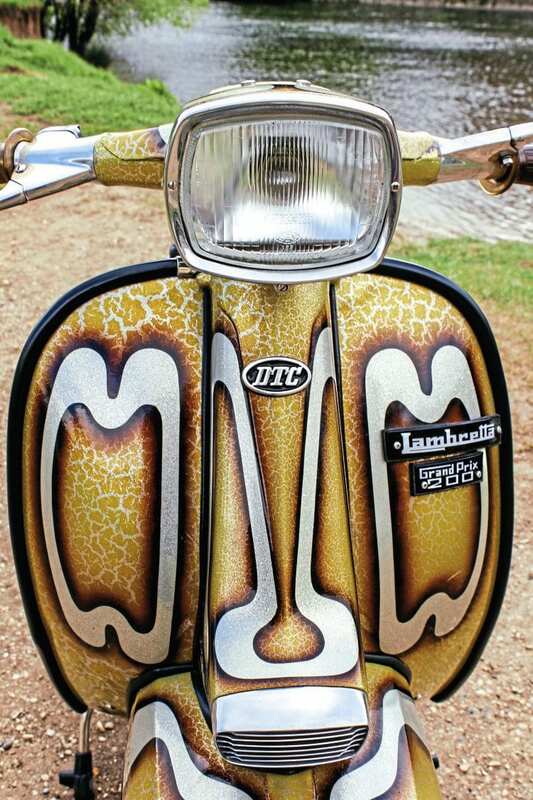 Many of the custom scoots I saw on the rallies between ’86 and ’91 had a huge impact on me. “Some that really stood out (especially for me) were Dazzle, Sonic Dream, Mask and Brazilian Love Affair. Back then I always lusted after a full blown custom. It was all so new and exciting to me even though I had no money to speak of. Anything I had to spare went on beer, petrol and two-stroke oil but I promised myself that one day I would own an 80s custom scooter. 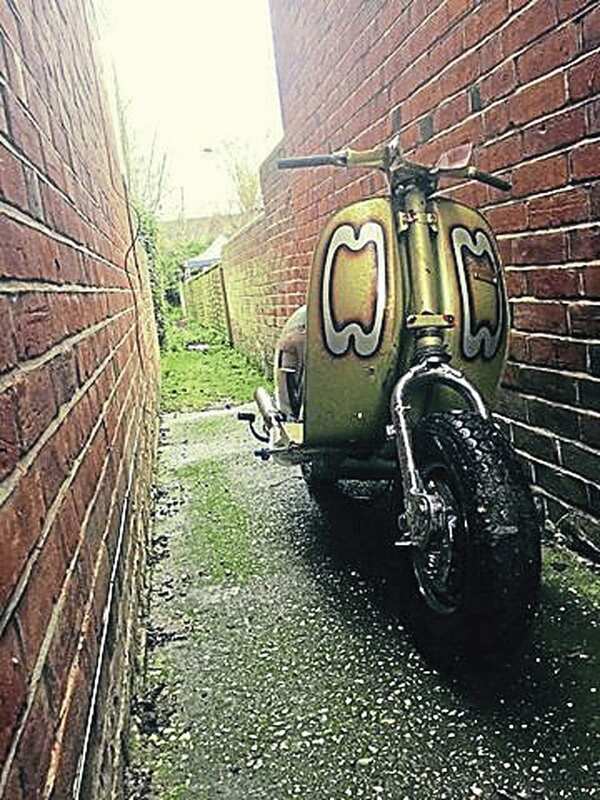 “After I’d finished my frame-breather rat rod, I was working on Pacemaker, my 60s style street racer Lammy. I was at a point where I was waiting on various parts to arrive so I could finish that one. I thought, what shall I do for my next project? 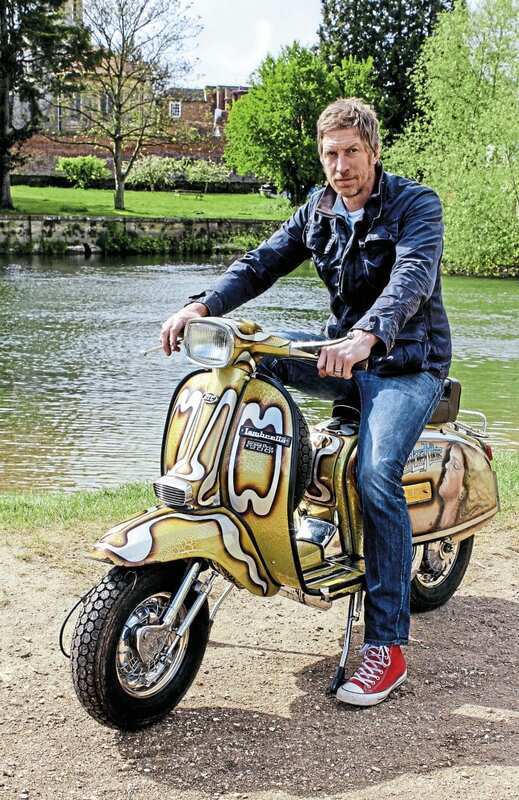 “I’d wanted an 80s custom with metal flake paint since I was a young and skint scooterboy in the 80s so the idea of building an old skool 80s custom seemed ideal. My intention was to build it completely from scratch, using as many 80s parts as possible. I began sourcing 80s engine and frame fittings while on the lookout for a suitable 1980s Indian GP. I wanted the engine to be as authentically 80s as I could get it: Amal Mk 2 carb, OTT Fresco exhaust, 80s lightened flywheel, Asso piston and an Indian GP engine. 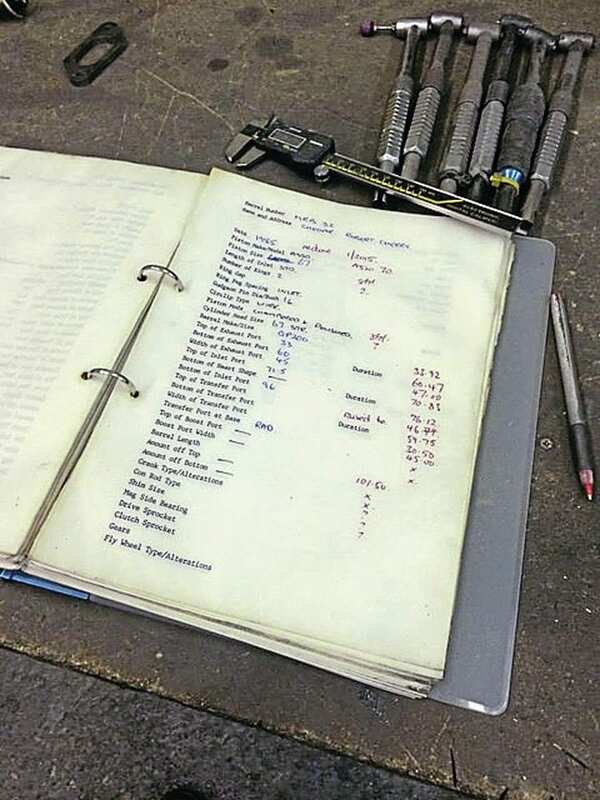 “I got hold of a Broady-tuned 225 barrel, which was done in 1985. It’s stamped, well centre punch dotted, MRB 32 — making it the 32nd barrel Broady tuned. I’d decided that the cowlings, hubs, tank, forks, wheel rims and similar would be in chrome. No engraving, very much 80s old skool. I got myself a bare Indian GP200 engine casing which needed a bit of work, though far from beyond rescue. 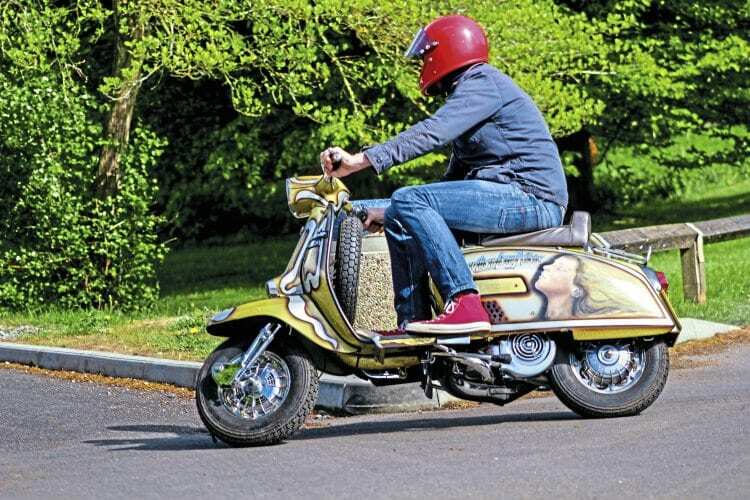 “I was still searching for a suitable 80s Indian GP frame when Brazilian Love Affair, well, the frame and bodywork, minus the rear left-hand floorboard, popped up for sale — so I grabbed it. It was pretty much perfect for my 80s project, although I had to make a decision whether to have the paintwork redone or to leave it as I got it. “I opted to leave it as it was. The original paint job, with genuine patina in a few places, though I would need to do whatever I could to stop it from deteriorating any further. The way I see it, leaving the paint as it is makes it more interesting and my own version of Brazilian Love Affair. “When I start on a project, as things progress and I get deeper and deeper into it, I develop obsessive tendencies. While parts were being amassed or off having work done on them, I began to research the history of Brazilian Love Affair as much as I could. I looked into any kind of information I could get on the parts too. For instance, under the kickstart 80s Fresco exhausts aren’t hard to find. I wanted an OTT Fresco, the cut and shut type, but this was surprisingly hard to get. “I eventually found a tatty, battered and dented one. Being a fabricator by trade, cut it open, bashed out all the dents, then put it back together using the Indian casing as a template, so it would fit absolutely right. I wanted to have 400 x 10 Continental tyres front and back and a new set of Contis took some finding. Getting them meant the bumpstop (on the casing) had to be removed, and the stand needed extending a bit, otherwise, it wouldn’t have been any use. “While using as many 80s parts as possible, I also wanted the scooter to be fully functional for road use today. I needed things like 80s Kawasaki front shocks, mounted on Taffspeed 80s brackets, complete with brass inserts, via a clubmate (cheers Bruce). It’s running a four-plate clutch with extra strong MB springs. I’ve added a front disc brake (non-hydraulic), which Brazilian Love Affair didn’t have when it was first done; the original orange GP200 came with a drum front brake. “There are one or two other more contemporary upgrades on it too. I sent the barrel back to Broady to have a few tweaks and to bring up to date. During my obsessive researching I found out that 2015 BGM stator plates were made to fit with AF Rayspeed lightened flywheels, so, of course, I went with that. I did set myself a loose target to have it done in a particular timeframe but I’m a binge builder. I go full on working on something in every spare hour I have, then I’ll step away for a while before getting back on with things. “A couple of self-imposed deadlines came and went before I actually finished redoing Brazilian Love Affair (early 2017). I toyed with the idea of using aged chrome parts, which would’ve been in keeping with the paintwork, but I decided to go with all-new/re-chromed parts. I’ve had new brass inserts made for the GP panel inserts. The ‘Love Reborn’ engraved on them isn’t a veiled statement to Brazilian Love Affair being resurrected. My obsessiveness when working on a project led me to obtain the George Duke album it’s named after and, for me, Love Reborn is the best track on there! 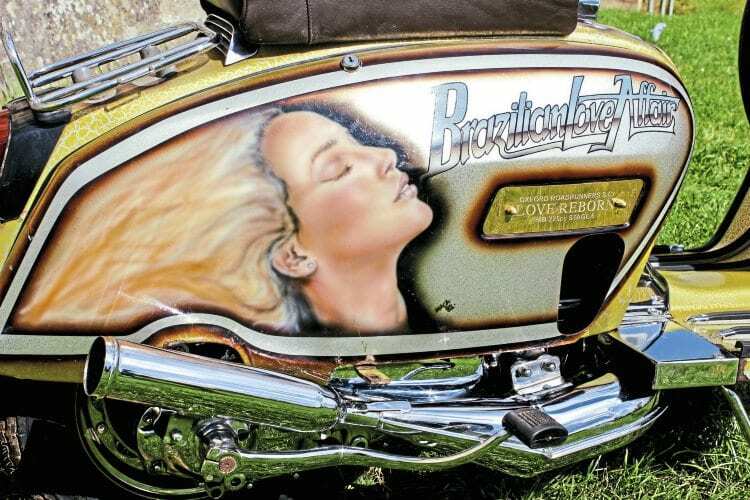 Although it was rarely shown during the 80s and 90s, Brazilian Love Affair was, and indeed is, one of a handful of truly iconic custom scooter creations of both the heady days of the scooterboy era and arguably of all time. Maca’s stunning artwork is now 35 years old and is showing a few signs of age. There’s minor rust on the front mudguard, edge lip on the leg shield floor section and one or two chips missing on the horncasting and headset too. Really close inspection of the muralled side panels reveals several micro blisters forming. It’s on its third engine and hubs, while the under-panel fittings are the second set. Nobby’s 2017 version of Brazilian Love Affair does have something of Trigger’s broom about it in some areas. Conversely, the frame, panels and bodywork, adorned with Maca’s handiwork, excepting a minor retouch to a side panel during the 80s, remain in original condition. Resurrected, refurbished and reborn, Brazilian Love Affair rides again, and Nobby has realised his dream in the process. 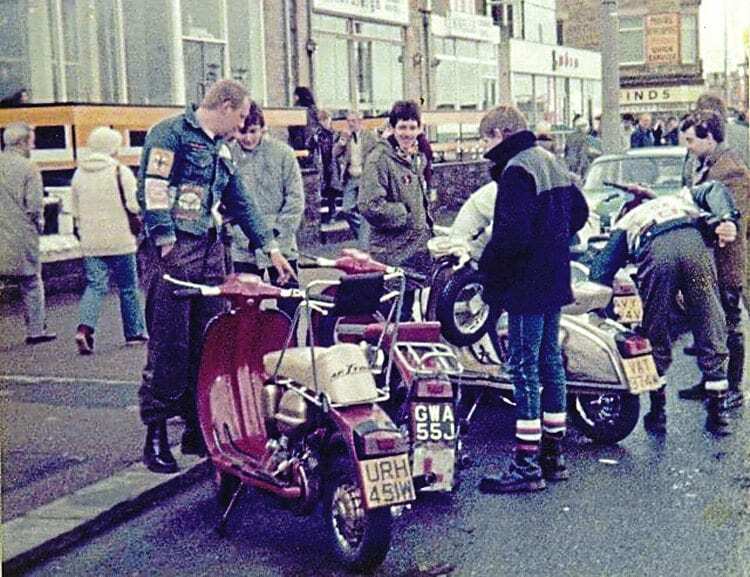 How and when did you first become interested in scooters: Early 80s, mini Mod mates and older lads in town. Seeing my first Lambretta ‘custom’ parked up at my local youth club. 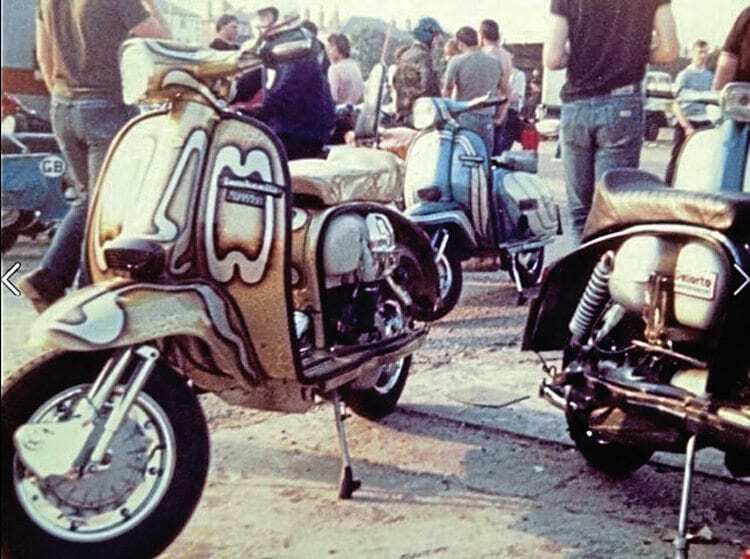 What is your favourite scooter model: SX, S1 and all S3 models, in that order! What is your favourite style of custom: Any with actual style. First rally or event: DiSC 86. How did you get there: Newly purchased T5! Any stories: It rained heavily on the way back and my mate didn’t have a visor so we burnt some cigarette holes in a shopping bag and he wore that as a ‘mask’ WTF!! Favourite and worst rally/event: I went to every rally between 86-91 and was probably the favourite time of my life tbh. Skegness 90 – heavy policing and the ‘camp site’ was three miles walk out of town full of dog shite! What’s the furthest you’ve ever ridden on a scooter: Bosel Germany/Rotterdam for two euro rallies in a week. 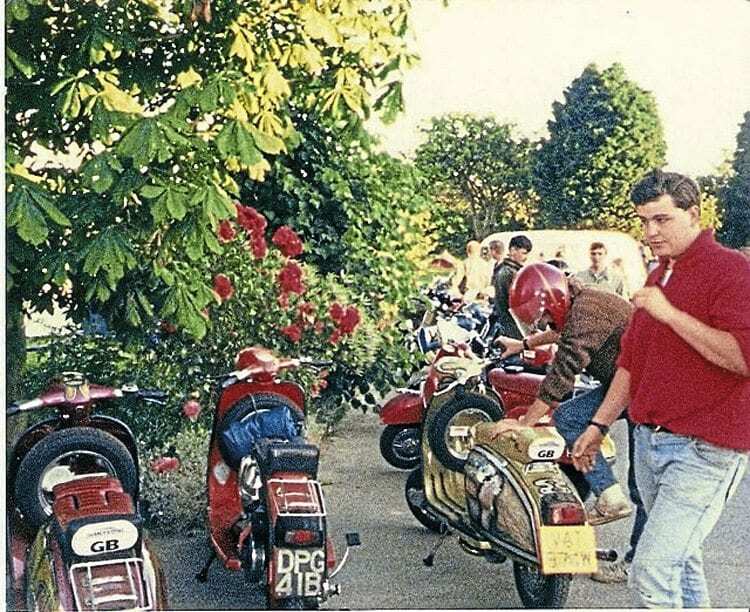 Has this scooter appeared in a magazine before: Scootering in 1997! 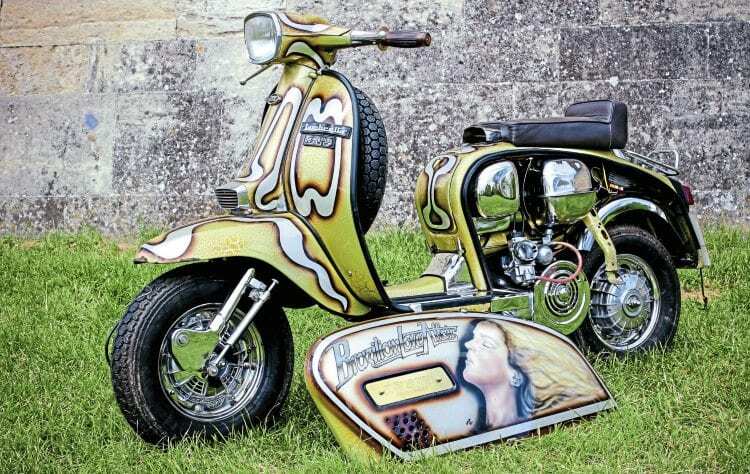 Has the scooter won any show trophies: Doncaster bike show best paint 1983. Name of scooter & reason: Brazilian Love Affair (George Duke jazz/funk LP). Scooter model: SIL 1981, UK, GP200. Date purchased & cost: 2015 (£1200 for frame and bodywork only ) + £1500 chrome, engine, etc. Inspiration for project: 80s old skool. Time to build & by who: 20 months, myself. Engine kit: Cast Innocenti GP200 tuned by Mark Broadhurst in 1985 (no 32) since rebored and retuned in 2016. Crank: MEC 58/107. Carb: Amal mk 2 power jet. Exhaust: Fresco. Clutch: 4-plate with MB springs. Gearbox: SIL GP200. Porting work by: MB. Dyno done by: Readspeed. Top speed & cruising speed: 60/75. Is the scooter reliable: Who cares? Look at it! Paintwork & murals done by: Original paint by Maca in 1982. What was the hardest part of the project: Finding free time. Imported from S.I.L. by AF Rayspeed, the orange GP that would become Brazilian Love Affair was sold to its first owner Neil lanson by Shelby Motors in Goole. Eighteen months after it was first registered in the UK, John Myers bought it for £200 and customised it. The name was borrowed from a George Duke jazz-funk album with the lettering font from the cover of Body Talk, an album by Brit-soul band Imagination. The picture on the panels was based on an idea John gave to artist Maca at Down Town Custom. While some believed it was meant to be John’s girlfriend of the time but he remains adamant that this was not the case. The Brazilian blonde theme resulted in the use of yellow vreeble. The paintwork cost £200 — effectively doubling John’s spend. The engine had a Stage 4 tune, Fresco exhaust and big carb. 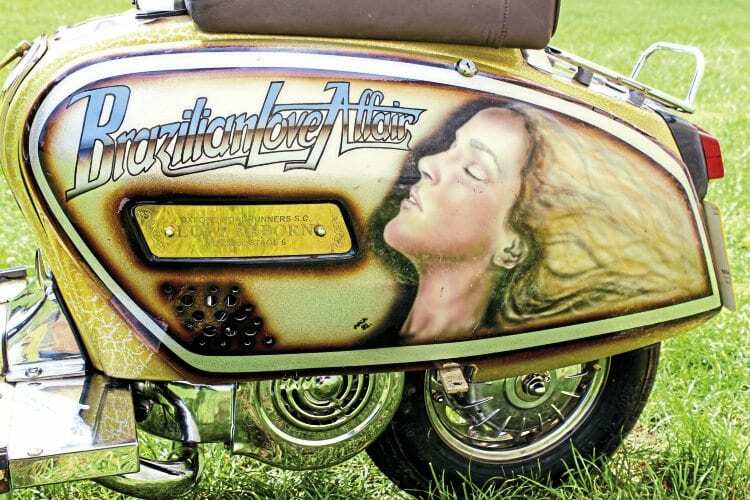 The newly-christened Brazilian Love Affair’s first run was to the Skegness rally in 1982 with the B-52s SC minus its panels, which were still being worked on. Its first rally as a finished scooter was Scarborough. Excursions to the Isle of Wight, Weston-super-Mare and all major nationals for a couple of seasons followed. 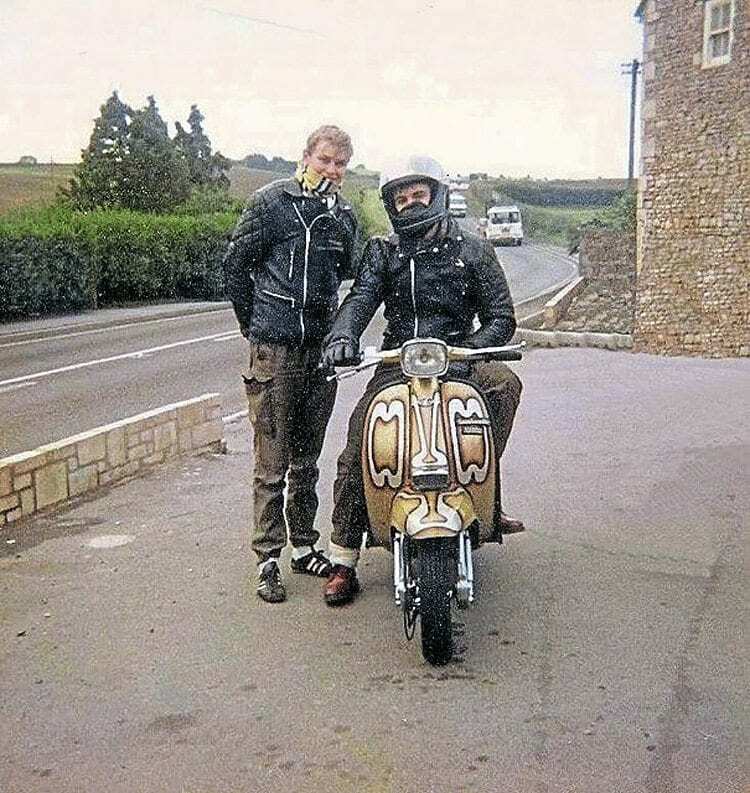 John, who now lives in the US, sold the scooter in December 1984 for around £700-£800 to Paul Shakespeare, based in the Nottingham area. He kept it until 1988 then sold it to Key Lowe aka Lowey, a member of Notts Britannia SC and one of the founders of VFM. In October 1990, Nick Jolly sold it on his behalf to Susan Lee from Norwich, girlfriend of Andy Horne. February/March 1997. Another sale, this time to Paul Parden followed. However, Brazilian Love Affair then sat in his garage for several years before being sold back to Andy, in whose garage it continued to languish. Next it was sold to Jimmy Lockwood, but not before the engine, under panel fixtures and fittings, forks and front wheel assembly were stripped off, leaving the frame, panelwork (apart from the left-hand rear floor board, which had disappeared), headset set up, horn casting, front mudguard and rear floor boards. 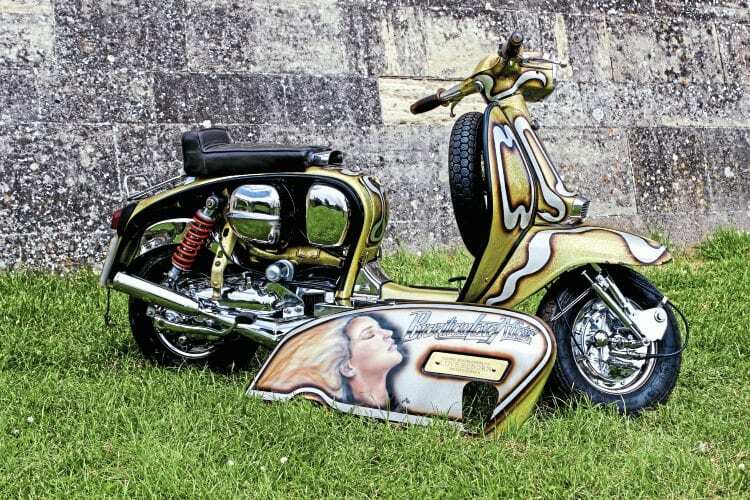 Finally, despite having provisionally booked what remained of Brazilian Love Affair back in with Maca, Jimmy lost interest in the project and moved it on to the current owner and rider Mark ‘Nobby’ Byron in May 2015 for £1200. Under two years later, after a gap of near on 20 years, Brazilian Love Affair is back where she belongs, on the road.